Epiphytes live a unique lifestyle that can be quite challenging. Sure, they have a relatively sturdy place on a limb or a trunk, however, blistering sun, intense heat, and plenty of wind can create hostile conditions for life. One of the hardest things to come by in the canopy is a steady source of nutrients. Whereas plants growing in the ground have soil, epiphytes must make do with whatever falls their way. Some plants have evolve a morphology that traps falling litter. There are seemingly endless litter trapping plants out there but today I want to highlight one in particular. Meet Bulbophyllum beccarii. This beautiful orchid is endemic to lowland areas of Sarawak, Borneo. What is most interesting about this species is how it grows. 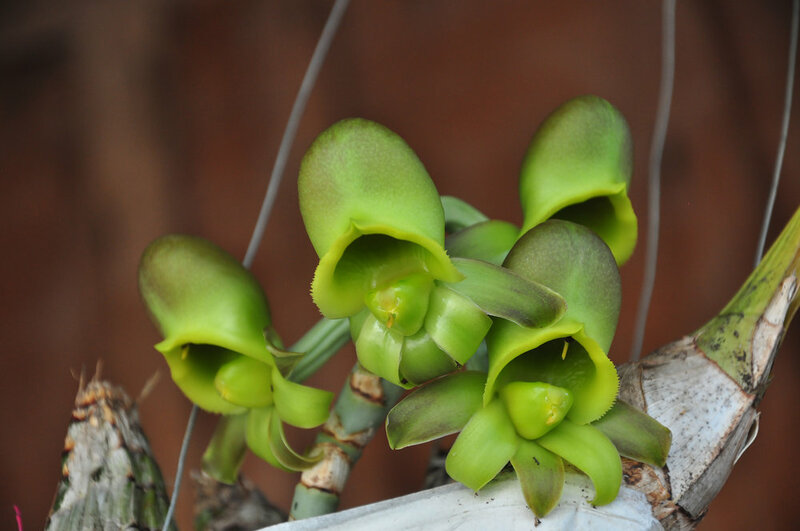 Instead of forming a clump of pseudobulbs on a branch or trunk, this orchid grows upwards, wrapping around the trunk like a leafy green snake. At regular intervals it produces tiny egg-shapes pseudobulbs which give rise to rather large, cup-shaped leaves. These leaves are the secret to this orchids success. The cup-like appearance of the leaves is indeed functional. Each one acts like, well, a cup. As leaves and other debris fall from the canopy above, the orchid is able to capture them. Over time, a community of fungi and microbes decompose the debris, turning it into a nutrient-rich humus. Instead of having to compete for soil nutrients like terrestrial species, this orchid makes its own soil buffet! If that wasn't strange enough, the flowers of this species are another story entirely. Every so often when conditions are just right, the plant produces an inflorescence packed full of hundreds of tiny flowers. The flowers dangle down below the leaves and emit an odor that has been compared to that of rotting fish. Though certainly disdainful to our sensibilities, it is not us this plant is trying to attract. Carrion flies are the main pollinators of this orchid and the scent coupled with their carrion-like crimson color attracts them in swarms. The flies are looking for food and a place to lay their eggs. This is all a ruse, of course. Instead, they end up visiting a flower with no rewards whatsoever. Regardless, some of these flies will end up picking up and dropping off pollinia, thus helping this orchid achieve pollination. Epiphyte diversity is incredible and makes up a sizable chunk of overall biodiversity in tropical forests. The myriad ways that epiphytic plants have adapted to life in the canopy is staggering. Bulbophyllum beccarii is but one player in this fascinating niche. I am beginning to think that there is no strategy for survival that is off-limits to the orchid family. Yes, as you may have figured out by now, I am a bit obsessed with these plants. Can you really blame me though? Take for instance Schomburgkia tibicinis (though you may also see it listed under the genera Laelia or more accurately, Myrmecophila). 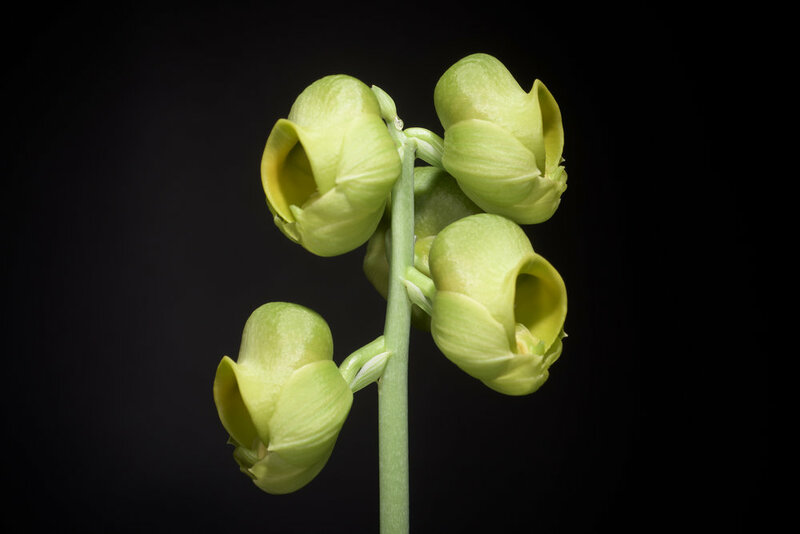 These North, Central, and South American orchids are more commonly referred to as cow-horn orchids because they possess hollow pseudobulbs that have been said to been used by children as toy horns. What is the point of these hollow pseudobulbs? A paper published back in 1989 in the American Journal of Botany found the answer to that question. As it turns out, ants are quite closely associated with orchids in this genus. They crawl all over the flowers, feeding on nectar. The relationship goes much deeper though. If you were to cut open one of these hollow pseudobulbs, you would find ant colonies living within them. The ants nest inside and often pile up great stores of food and eventually waste within these chambers. The walls of the chambers are lined with a dark tissue that was suspect to researchers. Using radioactively labeled ants, the researchers found that the orchids were actually taking up nutrients from the ant middens! What's more, nutrients weren't found solely in adjacent tissues but also far away, in the actively growing parts of the roots. These orchids are not only absorbing nutrients from the ants but also translocating it to growing tissues. While orchids without a resident ant colony seem to do okay, it is believed that orchids with a resident ant colony do ever so slightly better. This makes sense. 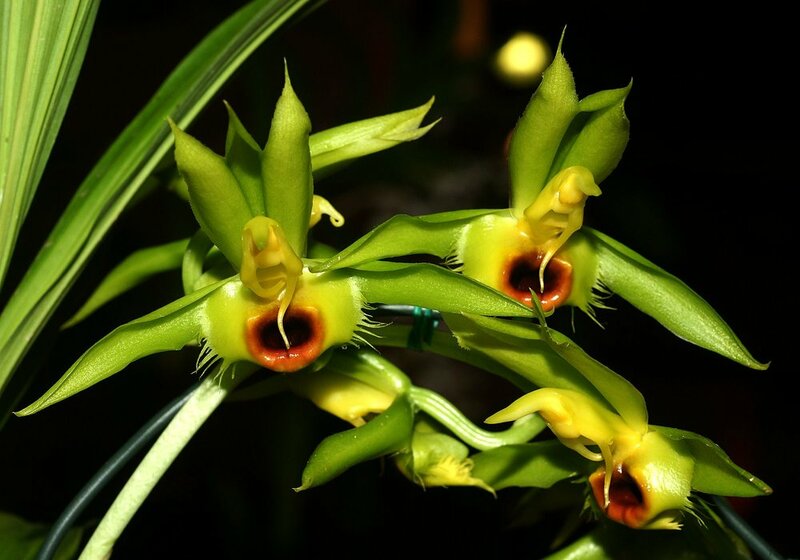 These orchids grow as epiphytes on trees, a niche that is not high in nutrients. Any additional sources of nutrients these plants can get will undoubtedly aid in their long-term survival. Also, because the ants use the orchids as a food source and a nest site, they are likely defending them from herbivores.